Size: 4 1/4" x 6 9/16". White first copy perforated to provide receipt and conveyor location stub for conveyorfile. Standard conditions are printed on the back of white copy, unless we are told otherwise. 3 part forms available from stock. Heavy front copy with soft parts 2, 3 and 4. Size: 3.4" x 6 9/16" with perforated stub. 3 part forms available from stock. Soft copies on parts 1, 2 and 3 with heavy last copy. Size: 3.4" x 6 9/16". 3 part form available from stock. Soft copies on parts 1, 2 and 3 with heavy last copy. Size: 4 1/4" x 7 3/4" with 1 3/4" stub on hard copy. 3 part forms available from stock. Other back printing available only on request. Soft copies on parts 1, 2 and 3 with a heavy last copy. Customer release conditions are printed on the back of last copy above customer receipt perforation. Size: 3.4" x 7 3/4". 4 part forms available from stock. 5M per case. Soft copies on parts 1, 2 and 3 with heavy last copy. Size: 4 1/4" x 7 3/4". 3 part forms available from stock. Soft copies on parts 1, 2 and 3 with heavy last copy. 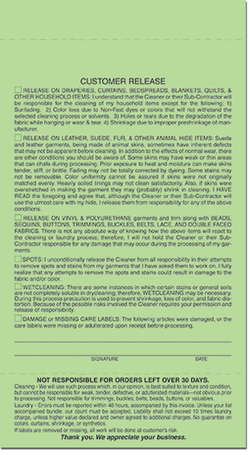 Customer release conditions are printed on the back of last copy above claim check perforation. Standard conditions are printed on the back of the claim check.